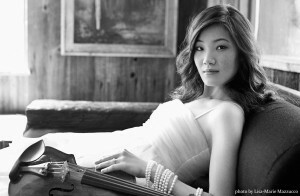 Violinist RACHEL LEE PRIDAY (PRY-DAY), acclaimed for her beauty of tone, riveting stage presence, and “irresistible panache” (Chicago Tribune), has appeared as soloist with major international orchestras, including the Chicago, St. Louis, Houston, and Seattle Symphony Orchestras, the Boston Pops, and the Berlin Staatskapelle. Critics have praised her “dazzling, forceful technique,” “rich, mellifluous sound” and “silvery fluidity.” Combining a fierce intelligence with an imaginative curiosity, her wide-ranging repertoire and eclectic programming reflect a deep fascination with literary and cultural narratives, as an artist who seeks contemporary resonances with the masterworks of the past. Upcoming highlights include Prokofiev’s Violin Concerto No. 1 with the Buffalo Philharmonic and Leon Botstein, recital appearances at the Sarasota Opera House and Dame Myra Hess Memorial Series at the Chicago Cultural Center, as well as premiere performances of a new violin and piano work by 2014 Pulitzer Prize finalist Christopher Cerrone, commissioned for the 14/15 and 15/16 seasons. Previous solo engagements have included appearances with the National Symphony Orchestra in Washington, DC, Colorado Symphony, Rochester Philharmonic, and Aspen Sinfonia at the Aspen Music Festival. She has performed in Korea several times, including repeat engagements with the Seoul Philharmonic, the KBS Symphony under the direction of Dmitri Kitaenko, and a four-city tour of the country with the Russian State Symphony Orchestra and Valery Polyansky. Rachel’s frequent recital appearances have brought her to such distinguished venues as the Mostly Mozart Festival at Avery Fisher Hall, the Kansas City Harriman-Jewell Series, Ravinia’s “Rising Stars” Series, Lawrence University, UCSB Arts and Lectures, and the Matinee Musicale series in Cincinnati. As a chamber musician, she has been invited to participate as a guest artist at the Los Angeles Chamber Orchestra’s “Chamber Music Marathon” and the Moritzburg Festival in Germany. Rachel made her European concerto debut in October 2006, performing the Sibelius Concerto with the Berlin Staatskapelle and Maestro Mikko Franck to an overwhelming response. In Europe and in Asia, engagements have further included recitals at the Musée du Louvre, the Verbier Festival, the Mecklenburg-Vorpommern Festival, and concerto appearances in Graz, Austria, Hong Kong, and Singapore. A graduate of Harvard University in English literature, Rachel takes a multidisciplinary approach to music that often lends itself to collaborative projects. This past June, she performed the premiere of Matthew Aucoin’s new work The Orphic Moment with Anthony Roth Costanzo and the Encounters Ensemble at the Peabody Essex Museum, in an innovative staging that mixed poetry, drama, visuals, and music. Other recent highlights include extensive interdisciplinary collaborations with Ballet San Jose, Symphony Silicon Valley, and conductor George Daugherty, as well as a week-long run of Tchaikovsky: None But The Lonely Heart, a theatrical concert bringing to life the strange relationship between Tchaikovsky and his patroness Madame von Meck, with Ensemble for the Romantic Century at BAM. Rachel has been profiled in the The New Yorker, The Los Angeles Times, Family Circle Magazine, and The Strad Magazine. Her television credits include appearances on the Disney Channel, “Fiddling for the Future” and “American Masters” on PBS, and the 2000 Grammy Awards ceremony in Los Angeles. In addition, her performances have been broadcast on major media outlets in the US, Germany, Korea, and Brazil, including a televised concert in Rio de Janeiro, numerous radio appearances on 98.7 WFMT Chicago radio, and American Public Media’s Performance Today. Rachel made her orchestral debut at the Aspen Music Festival in 1997 at the age of nine, and the following year performed at the 50th anniversary of the Universal Declaration of Human Rights at the United Nations. A native of Chicago, Rachel began her violin studies at the age of four, and in 1996 moved to New York to study with the late pedagogue Dorothy DeLay, continuing her studies with Itzhak Perlman at the Pre-College Division of The Juilliard School. She holds a B.A. in English from Harvard University, and in May 2011 received a master’s degree, studying with Miriam Fried at the New England Conservatory through its joint dual-degree program with Harvard College. She performs on a Nicolo Gagliano violin (Naples, 1760), double-purfled with fleurs-de-lis, named Alejandro.